Hello, everybodeee! Grover is in Israel and learning all kinds of things. He struggles a little with Hebrew words, but not with the idea of finding ways to make the world a better place. Grover and his new friends will be doing a mitzvah, which is doing something nice for others. Brosh, Avigail and Mahboub along with Grover work in their neighborhood park after a storm left it a mess. The local grouch, Moishe doesn’t want any part of a mitzvah. Too much time, too much trouble! So the kids get to work without him, even mixing paint and having a little lesson on colors, Sesame Street style. The playground is beautiful with the freshly painted equipment and the trash gathered into bags. Moishe can’t stay out of the trash. When he separates the trash from the non-trash, Grover points out that recycling is a mitzvah. Moishe’s day gets even worse. Grover and his friends aren’t grouches. They know it’s time to wash up. The power of Sesame Street is put to work presenting Jewish concepts and Hebrew words as well as using familiar characters to show the universal truths of the Jewish faith. It is a good read aloud for either a lapsit or for a class. It would fit into a unit on Israel or for Character Counts. Have students list the kinds of mitzvahs they could do in their school or neighborhood as a literacy activity. The solid second grade reading level makes this suitable for second graders to read to either younger reading buddies or to make their own audio book. The publisher’s website has many activities on their blog, which could give educators ideas for how to use this books in the Shalom Sesame series (http://karbenbooks.blogspot.com/). 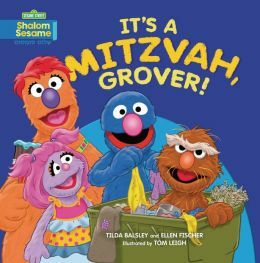 TITLE: It’s a Mitzvah, Grover!